I'll be doing a few events in 2012. Here's a list of the ones I know for sure now. Not that much has been happening here lately at the Palace, but I'll be shutting the doors and turning off the lights until the new year. 2011 draws to a close. Here's a list of my fiction that appeared this year -- originals and reprints. As for 2012, there are a few things slated for publication, including a new story collection, Crackpot Palace, due in August. Only time will tell how it will all shake out. See you in the New Year. 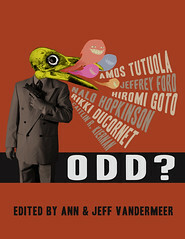 A nice review of the John Kessel and Jim Kelly edited Kafkaesque anthology from Tachyon at CzechPosition.com. "The sheer variety of stories makes the book a delight to read as well as indicating what a vast resource Kafka’s work remains for writers." —Brought to you by Ann & Jeff VanderMeer, the team behind such anthos as The New Weird, Steampunk Reloaded, Last Drink Bird Head, The Thackery T. Lambshead Cabinet of Curiosities, The Weird: A Compendium of Strange and Dark Stories, and the Best American Fantasy series. Just post an odd true-life story of something that happened to you in the comments thread of this blog post any time between now and Friday, October 21, and you could appear in the next volume of ODD? Yes, that’s right. You could receive a contract for your weird true-life story to appear in ODD? Not only that, the winner will receive a year’s subscription to both the ebook and print versions. Under 1,500 words, please, and anything above PG-13 will need bleeps. TO BE JUDGED BY ODDITY AND MULTIPLE WORLD FANTASY AWARD WINNER JEFFREY FORD! WHAT’S WITH THE COOL VIDEO?! The video featured above is a unique short film by Greg Bossert celebrating ODD? Bossert, based just over the Golden Gate Bridge from San Francisco. has done research and design for feature films—including the Neil Gaiman/Roger Avary adaptation of Beowulf and Tim Burton’s Alice in Wonderland—and worked on creating visuals and sounds for independent films, including the One Minute Weird Tales video series. His stories have appeared in Asimov’s Science Fiction and ESLI Magazine. Find out more at Sudden Sound and his website. WHAT THE HECK IS A CHEEKY FRAWG? Cheeky Frawg specializes in quality, self-aware e-books. We hand-craft every e-book on a letterpress using only the best, most perfectly formed 00000s and 111111s. Our e-binding is hand-rolled by former Cuban cigar makers, our interiors are lovingly formatted by Neil Clarke, and our covers, unique back covers, and wallpapers are designed by the Las Vegas Madman, artist Jeremy Zerfoss. Cheeky Frawg is a joint production of Ann and jeff VanderMeer. Join us on facebook! I've been teaching a Fiction writing workshop every Thursday night, 7-10, in the Fall and Spring semesters, for about 8 years. A strange thing I've noticed is how often the stories on a given night will all share a similar theme or type of character or some object or image when no specific assignment was given. The assignment is always the same -- "Write a story." This synchronicity seems to me to go beyond mere coincidence. There might be a night with 3 of the 4 stories having ghosts in them or the devil will show up in all of them in a given night. Sometimes it's very subtle -- a passing reference or nod to a famous historical figure or film will be worked into a number of the pieces. I became aware of this early on and have tracked its occurrence for years. Is this some kind of group mind thing or merely a malaise of fiction workshop paranoia? One of the things I've noticed is that this happens most with workshop groups that have turned out to be awesome. When I notice it starting to happen in a given class, I take it as a good sign. I know, I'm nuts. But if you teach a Fiction workshop or participate in one on a regular basis, drop me a line and let me know if you've experienced this. The end of the year is coming on, but I've still got a few more publications on the way. Here's a round up of the incoming for the remainder of 2011. "Weiroot" will appear in ODD? another anthology by the VanderMeers. I believe this is coming out from their own e-book imprint, Cheeky Frawg. It is also due for October. In addition to the e-book, I think there will also be a limited supply of hardcopy books as well. I'm excited about this one, getting to appear alongside one of my literary heroes, Amost Tutuola, as well as some of my favorite contemporary writers -- Michael Cisco, Caitlin Kiernan, Rikki Ducornet, Jeffrey Thomas, Nalo Hopkinson, Hiromi Gato, etc. "Glass Eels" will appear in the anthology New Jersey Noir, edited by Joyce Carol Oates for Akashic Books. This one's coming in November. I've already flogged this book to within an inch of its life here at the palace and on FB, but it's worth it. The intro essay by Oates concerning the intersection of Noir and the Garden State takes no prisoners and is worth the price of admission. Fiction, poetry and photography. "Bright Morning" will appear in Kafkaesque, edited by John Kessel and Jim Kelly for Tachyon Books. This one will be out in November. My hat off to the editors. An anthology many have probably dreamt of, but these guys actually created. A compilation of stories inspired by the life and work of Fraqnz Kafka. I'm particularly looking forward to John Kessel's new translation of "A Hunger Artist," my favorite Kafka story. Emily dropped by tonight. She stepped out of the shadows bearing a peach liquerer she and Lavinia had concocted. She wore a dark blue dress with a white lace collar. Her hair was down. She looked paler than usual and tired. We sat at the kitchen table, and she filled me in on old Amherst, who was doing what and who was doing who. I told her about a news story I'd read in which light traveled faster than the speed of light. "The speed of light," she said, "I'm stealing that." "Knock yourself out," I said. Then she confessed she was reading Keats again, and I told her, "Move on, what about Whitman?" She smiled and laid this poem on the table. "I'll read it," I said. "Suit yourself," said Emily. I lifted the page and she poured, the scent of summer rising from my glass. When I looked up to tell her how much I liked the third stanza, she was gone, back in her room, writing by candlelight, and the kitchen was cold. Marty Halpern has an anthology coming out from Night Shade later this year called Alien Contact. My story, "Exo-skeleton Town," appears in the book and is also being posted in two parts at Marty's blog. The first part is up now.